We have all the specialist equipment and knowledge to take care of your area rugs. Rug Cleaning to a Superior High Standard. With an extremely thorough cleaning process for rug cleaning, We’ve invested in the best state of the art equipment from around the world. Both Derek and Sian have given lots of time and dedication to intensive training to extend their knowledge of rugs, cleaning and restoration on a regular basis. We are quite often told by our customers that they would like their rug cleaning because their pet spends most of their time sleeping on it. In most cases we are also asked to treat Pet accidents and odours, there are plenty of suitable treatments to completely eradicate the odours. More importantly we don’t use over powering fragrances to mask the odour. Our process and treatments leave your area rug odour free and safe for your pets to enjoy once again. 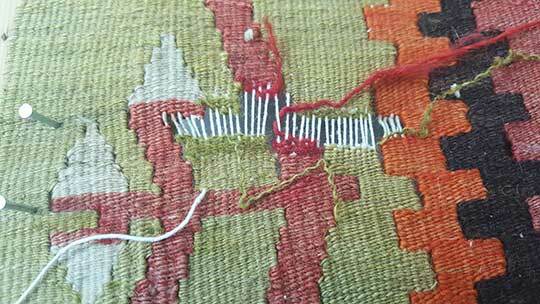 Our rug repairs and restoration service appeals to everyone from loss adjusters, fire and flood companies, to any one who has damage to their precious rug, Whether from it’s from a fire or pet damage, age, mould or general wear. Arcadia have the knowledge, dedication and equipment to restore even the worst damage. We have brought many sentimental, precious rugs back to life and avoided being sent to landfill. Here at Arcadia, we clean very differently to what you may have seen before and therefore it is worth taking the time to watch our video that explains exactly what it is we do. You will see for yourself just how different our washing process is compared to the traditional carpet cleaning machines that you may have used, hired or even had a professional in to clean for you in the past but it just didn’t do the job. 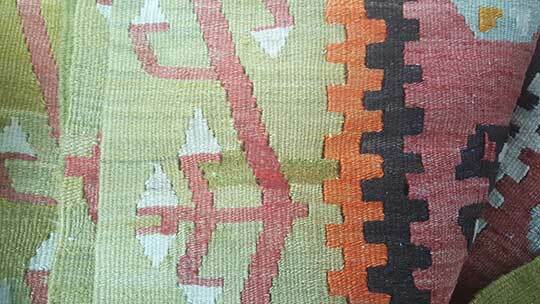 Rugs are very different to carpets in many ways from the way they are made to their construction and as a result the equipment and cleaning process is also very very different. 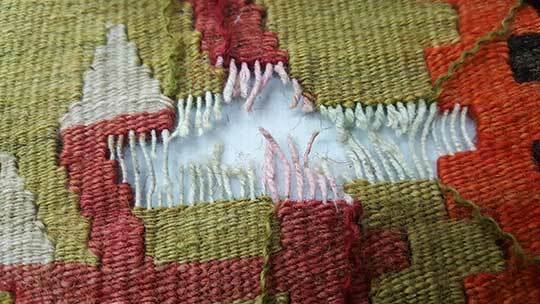 As well as our Rug washing service, we have an in-house Rug repair service too! Along with our extensive cleaning service, we also offer a restoration & repairs service. We can restore & repair fridge damage, side cord damage, holes and tears, dye bleed correction, backing issues, missing tufts, colour restoration for wool silk and nylon fibres. Took my lounge rug that had been used as a puppy pad. sisn was very helpful and they dud a superb job, it looks like new. excellent professional service! would definitely use again and recommend to anyone! Wow!! My rug looks brand new & im so glad I never threw it away. Sian & Derrick are highly recommended & 100% i will return. Thanks guys!!! So pleased with the results will definitely recommend to anyone. I have an elderly dog who has accidents, my rug didn’t smell great and had a few stains on it I saw once I took it to be cleaned. ( didn’t see them at home) I’ve just picked it up and I’m gob smacked! All stains and bad smells gone, completely. It looks as good as new! !Highly recommend Arcadia Rug SpaThank you! A fantastic service, and amazing results. My old cream (and very grubby) rug came up a treat. Their level of customer service and passion for the job is rare to see these days and if that wasn’t enough, they are very competitive on price too. What an amazing place. Absolutely brilliant. moved to France and bought a beautiful patchwork pure wool rug/carpet for an song. As it was 2nd hand it needed a good clean. So on my next trip to the UK the rug had to go with me. The rug is now like NEW thanks to these amazing people. 5 stars rating without a doubt. thank you so much. thank you for bringing my rug back to life after our little visitors decided to claim it for themselves. It's just like new and smells lovely!! First class service, we have just had a second oriental wool rug cleaned by Derek and Sian that had pet stains we thought would not come out how wrong could we be they worked their magic keeping us fully informed and returned the rug (approx. 40 yrs old) looking like new .I would have no hesitation recommending them . Friendly and helpful. Well kitted our operation for. Range of sizes and types of rug. My runner that’s been in the garage for 12 years looks as good as new! Always an excellent service from a very friendly and professional local company. Highly recommend Rug Spa, Perfect company to deal with a completely professional in what they do. 5 Star! Sian and Derek are true rug cleaning professionals, what they do not know about rug cleaning is not worth knowing! 5⭐️Thought our ikea rug was ruined, filthy and completely flattened and impossible to hoover out all the bits, it was grim. We were wrong, it is now smelling like a new carpet and soft and fluffed up again. Couldn’t be happier, cheers. The customer service was excellent and the attention to detail I had a rug cleaned which is in my treatment room and was stained with essential oils,this came up as good as new.Thanks very much. Excellent service at Arcadia. I have had 3 rugs cleaned and one repaired and have been delighted with the results each time. Took our tired, dull, flat rug to Arcadia and they produced a miracle! Pile completely revived, rug beautifully soft and colours so bright! Absolutely wonderful job done! First class - personal but very professional attention. Impressed with the rug cleaning process and delighted with the result. Visitors thought we had bought a new rug.No hesitation in recommending this firm. We had two rugs that had become very dirty through owning two dogs and also damaged by trying to clean them ourselves in our bath at home. Never again! We not only damaged the rug but we also damaged our bath by scratching it with sand from the rug. Sian and Derek helped repair and clean them superbly. They looked brand new when we got them back! Highly recommended service. We will be going back with my mums dirty rugs soon! Took my rug into Arcadia, they have done a fantastic job and it looks better than new! Highly recommended and will definitely use again. Just got my rug back from Arcadia and it’s like a new rug! Thank you!! I wouldn't use anyone else.Amazing hardworking skilled and talented people running this business.Thank you both so much. Fantastic service reasonably prices. Can't fault. Fantastic professional service. Indian rug cleaned so it really looks like new.Highly recommend. Great guys who know exactly what they are doing. Strongly recommended. I recently had my rug cleaned by your company and I can honestly say when I got it back off yourselves it was like getting a brand new rug back. A fantastic company running an exceptional rug cleaning service. I would highly recommend and will be using you again in the future. Many thanks. Absolutely amazing! These guys work really hard and returned my rug like new! Highly recommended! The best care for your rugs, excellent service! Dear Sian. I just wanted to thank you all for the fabulous job you have done on our Turkish rug. We have only just been able to open it up and have a look ( our downstairs is still without flooring following the leak last November) as we have had to put it in a spare bedroom for now. The colours have come up beautifully and it looks brand new. My husband is quietly thrilled as we had been so dubious about having it cleaned In this country. ( He is Turkish and we bought the rug in Izmir back in 2004). Having watched your online video I was pretty certain you could do the job and you certainly have!! Thank you for the friendly and helpful service and the fabulously professional cleaning job! Magic! 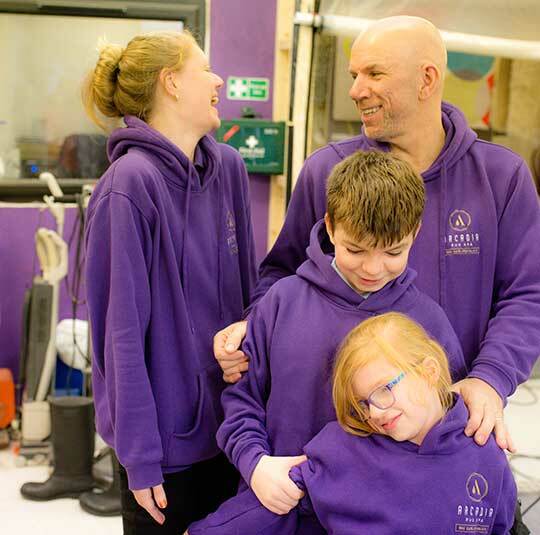 Keeping it in the family – Arcadia’s husband and wife team. We are passionate about our business, and our repeat custom and large client base shows that we just love working with people. 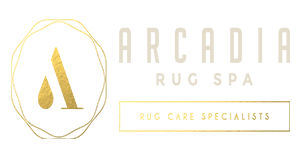 As a husband and wife team, we independently own and operate Arcadia Rug Spa, and as such, and as a result we put our life, soul and passion into the company. We research,understand and undertake expert cleaning and restoration of a wide range of rugs.